You use a separate shampoo and conditioner. You maintain your beard appropriately. You even use your girlfriend’s serum regularly now. You embrace grooming and self care like the truly evolved man that you are—and I couldn’t be more proud. Actually, I could. I want to nudge you gently towards another highly beneficial just-beyond-the-basics step in your routine: a scalp treatment. Whatever your issue might be—thinning hair, dandruff, dry or oily skin, unruly texture—a scalp treatment can help remedy the condition and get to the root (lol) of the problem to keep it from happening. 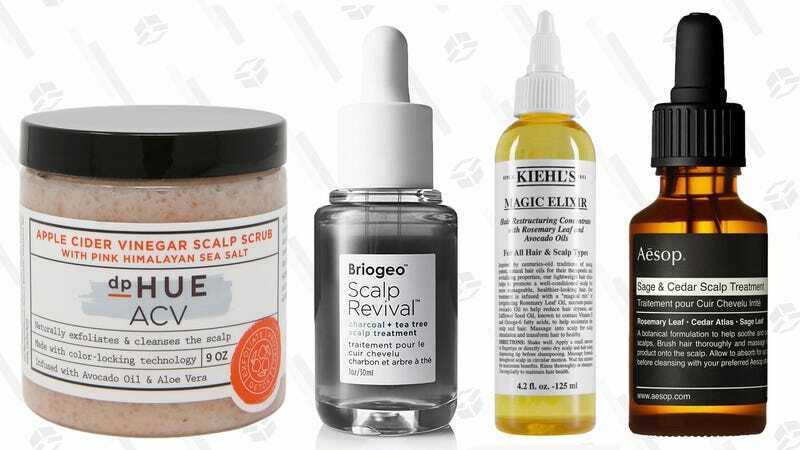 Best of all, most of these treatments involve little more than massaging a really good-smelling product onto your head then hanging out for a bit before showering. You can change your life while sitting on the couch and looking at Instagram. I’ve been using this product for about half a year and absolutely love it. I’m a big fan of dry shampoo, which is a product that absorbs oil and lets you go more days between washing your hair (nice), but leaves a lot of buildup (yuck). Every couple of weeks I use this scrub instead of a shampoo to slough off all that product and scrub away dead skin cells. The apple cider vinegar basically cleanses and conditions your hair, too, so the result is a happy scalp and really soft, fresh hair. If you’re using mousse or pomade on the regular, your hair will thank you for adding this stuff to your routine. Hims offers a range of products, both topical and ingested, aimed at helping you manage and slow the progression of thinning hair. Minoxidil (which sounds like something you should need a prescription for, but you don’t!) is an affordable, FDA-approved product you can use up to twice daily. It’s easy to use; just let a drop of product marinate directly on your affected scalp for a few hours before showering or laying down on a pillow, etc. Over time, the Minoxidil will work to shed old hairs and replace them with new, thicker ones. Score! As your hair thins, and especially if you’re bald, your scalp is exposed to the elements—mainly our good buddy the sun. Protect your hair and that noggin with a nice smelling, conditioning, protective spray with SPF. Coola’s scalp and hair mist has all kinds of good ingredients that will improve the overall health of your scalp and make your hair shiny—while SPF 30 protects you from getting burnt! Briogeo’s scalp treatment is absolutely packed with natural, good-for-your-skin ingredients. Witch hazel helps control oil, charcoal works to draw out impurities and detoxify your scalp, while peppermint and tea tree oil add a cooling effect to soothe and reduce flakiness. A clinical study found that, “100% of participants with a self-assessed flaky scalp said the treatment was effective at reducing flakiness.” That’s… A pretty good endorsement, no? Here at SG HQ, we love Aesop’s products because they feel luxe to use and they’re effective. (Cedar and sage might be the best scent combo...ever?) If you’re dealing with dry flaky scalp issues, this treatment should become part of your pre-getting ready routine a few times per week. Brush your hair first, then put about five drops in your hands and massage the product directly onto your dome. Let it chill for about 15 minutes, then hop in the shower and shampoo and condition as usual. Yeah yeah, it’s kind of a lot, so just reward yourself with one episode of Schitt’s Creek while you wait. It’s the perfect run time! The natural ingredients will work their magic to soothe and protect your sensitive scalp. Listen, we don’t all wake up looking like Timothée Chalamet, with perfectly undulating curls framing our youthful faces just so. For those of us who need a little help controlling our mops—enter Kiehl’s Magic Elixir. Use this pre-shampoo treatment (massage a little onto your scalp when your hair is still dry, wait 10 minutes) to condition and smooth your hair. Softer, smoother hair is more manageable and easier to style. Voila, you might yet be a Chalamet in the making!